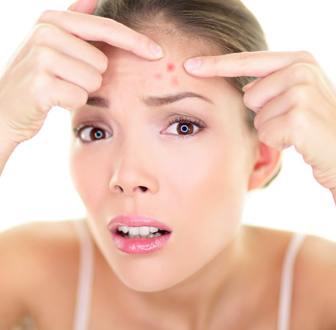 Should you go to a dermatologist for your acne? This blog is an excellent account of one person’s experience in going to a dermatologist to treat her acne—and how she regretted it. Instead of an analysis of her skin, a discussion of what products she was currently using, and her diet; her doctor prescribed her a number of harsh prescription treatments and sent her to the pharmacy. She saw no improvement in her acne, and her skin began to peel, turn red, and look shiny. This is something I have seen with numerous clients using harsh products that are only harming their skin—not improving it. I always recommend using the gentlest products possible, while still getting effective results. Don’t get me wrong; there are times when visiting the dermatologist is necessary. There are many dermatologists who do complete consultations and are extremely helpful in improving skin. And I will always refer clients to a dermatologist for spots that look questionable. However, try an esthetician first. When you book a facial with me, you can expect an in-depth skin analysis, a discussion about your skin-type, and what products you’re currently using. I will use the gentlest products custom-fit for your skin-type, and discuss the best home skin care program to keep your skin healthy and looking its best. Book an appointment or consultation with me here!